Modi referred to the Monday earthquake with epicentre in Uttarakhand to take a jibe at the Congress vice-president, who had famously said earlier that if he opened his mouth there would be tremors. NEW DELHI: With just three days left for the people to cast their votes in the first phase of the elections in Uttar Pradesh, political fever gripped the Lok Sabha on Tuesday, as Prime Minister Narendra Modi launched arguably one of his most acerbic attack on politics of dynasty with clear targets of the Rahul Gandhi and Akhilesh Yadav duo even while he sought to portray himself as a messiah of the poor in pursuit of the corrupt and the rich through demonetization. 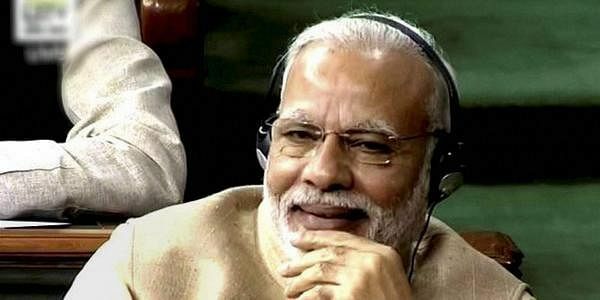 While taking the floor to reply to the motion of vote of thanks to the President Pranab Mukherjee’s speech to the joint session of Parliament, Modi referred to the Monday earthquake with epicentre in Uttarakhand to take a jibe at the Congress vice-president, who had famously said earlier that if he opened his mouth there would be tremors. “At last the tremor came, but there must be some reason that Mother Earth got so anguished. At a time when somebody sees a sense of service and humility even in SCAM, then not only the mother but even the Mother Earth gets upset, and an earthquake happens," the Prime Minister quipped. Modi in his Meerut rally had coined “SCAM” for Samajwadi Party, Congress, Akhilesh Yadav and Mayawati. Countering the claims of the leader of the Congress in the Lok Sabha Mallikarjuna Kharge that his party leaders had been the prominent freedom fighters, Modi launched himself into a no-holds-barred attack against the Opposition outfit. “This country very well knows the democracy of the Congress. Democracy has been sacrificed at the alters of one family, which thrust Emergency and turned the nation into a jail,” said Modi, while adding “we have not grown up in tradition of rearing dogs” in an apparent dig at the penchant within the Gandhi family for pets. “Hum desh ke liye jee rahe haen (We live for the country,” Modi said amid loud chants of “Jio” from the Opposition benches, which were repeated throughout the 85-minute long speech of the Prime Minister. Returning the barbs of Kharge on demonetization, the Prime Minister stated that unlike the past when the country talked of loss to the exchequer in scams in coal and 2G spectrum allocation, the Opposition now asks how much (money) Modi brought back. “Aap kitne bhi bade kyun nahi hon, aapko garib ka haq luatana padega (no matter how big you are, you will have to return the dues of the poor). We are not concerned about the outcomes of the elections, but the well-being of the country. Therefore, we took the well thought decision on demonetization at the right time. We will take more action under the Benami Act against those who are hoarding black money in kind and properties,” Modi said to the thumping of the desks by the treasury benches. Modi quoted Ancient Indian philosopher Charwak to hit out at the UPA dispensations, besides making the Aam Admi Party MP Bhagwant Mann uncomfortable with his remark, that had the Punjab leader been there at that time he may have advised drinking something other than clarified butter. He also quoted famous Hindi poet Kaka Hathrasi’s line “Antar pat par khojiye chuppa hua hai khot, Mil jaayegi aapko bilkul satya rapat (indulge in some soul-searching where some short-comings may be hidden, you may discover the truth)” to make case that the NDA government has made substantial progress on various socio-economic fronts in comparison to the UPA rules.